Growing up, I used to be a huge fan of fish. I would eat it quite often my mom said, and I remember even vying for the fish's eye whenever we had a whole beast. Somewhere along the lines, something changed though and I no longer was a fan of the aquatic meat source. The smell started to disgust me. The food got pushed away. 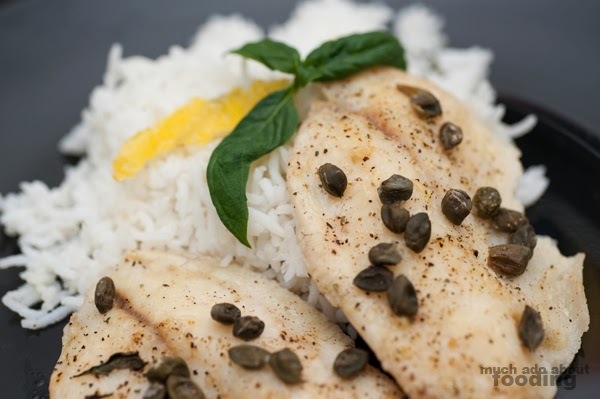 I've slowly come back to fish but mainly when it is prepared in a different manner than what I see at home. On the other hand, I love raw fish for some reason - sushi is a treat! So because I've been averse to it, I rarely ever cook it but there comes a time when you just have to. 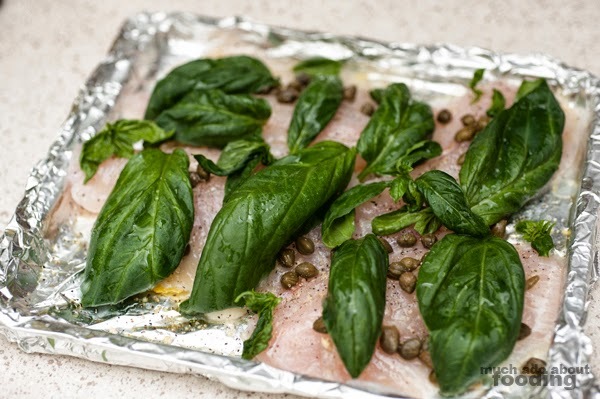 We had a lot of basil from the herb garden on hand so I decided to make this recipe of lemon basil tilapia with capers (we got the massive jar of non-pareil capers from Costco). Hope you enjoy it too! I actually baked these in a toaster oven since we were making cookies in the larger oven. It still worked out just fine! 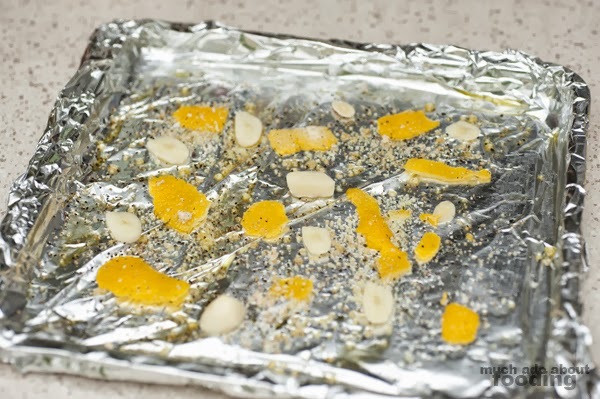 Brush a foil wrapped baking sheet with olive oil. Add 1 tsp garlic salt and 1 tsp ground black pepper. Slice garlic clove and lay on sheet. Place large strips of lemon zest on sheet as well. Pre-heat oven to 350°F. 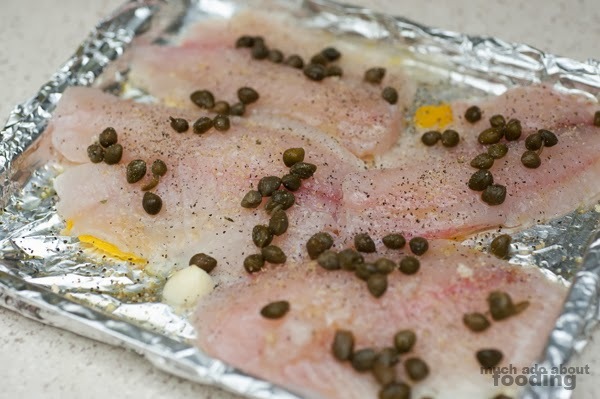 Lay fish down onto sheet, covering all of the zest and garlic. Brush filets with olive oil and sprinkle on remaining garlic salt and pepper. 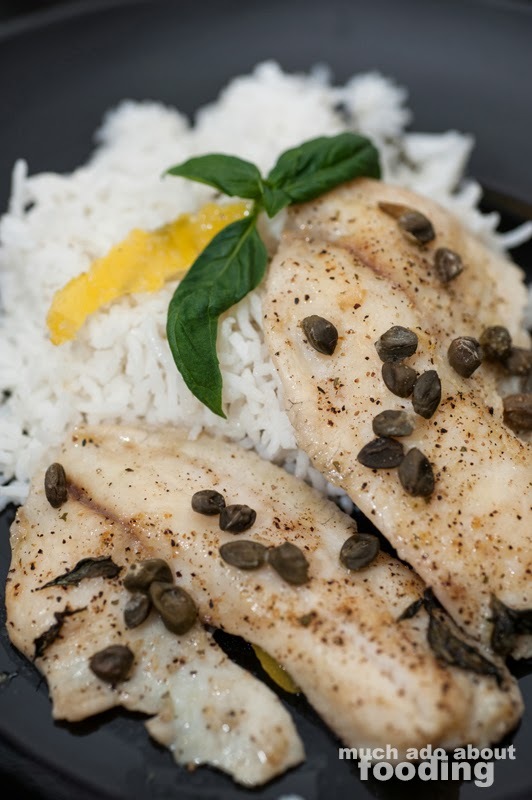 Top with capers - residual juices are fine. Squeeze over lemon juice. Layer large basil leaves on top. Squeeze over lime juice. Cover whole sheet with foil and slit holes to vent out hot air. This should create an environment of heat inside. Bake for 30-40 minutes depending on thickness of filet. Remove and let sit for a minute or two under foil tent before unwrapping to serve. Enjoy!